A worker checks the engine of a Lada XRay SUV in Togliatti. 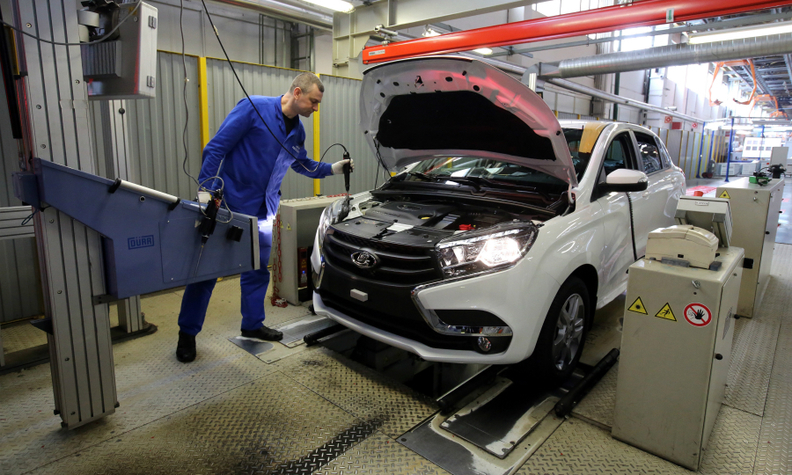 MOSCOW – Russia's biggest automaker AvtoVAZ said its main plant in Togliatti will move to a four-day week starting mid-October as the market continues to be hit by sluggish demand. The factory builds Lada, Nissan and Renault cars. It will work four days a week starting from Oct. 17 through Feb. 19, a company spokesman said. AvtoVAZ’s plant in Izhevsk will continue working five days a week, the spokesman said. This is second time this year that AvtoVAZ, which is controlled by Renault-Nissan, has cut the work week at the Togliatti plant. It went from five days to four for six months on Feb. 15, and shut down from July 25 to Aug. 14. The move comes as Lada reported a 4 percent rise in sales in Russia last month on the success of its new XRay SUV and Vesta sedan. In contrast, the overall Russian market, which is mired in a recession, fell 17 percent.